The last time you were in your garage, did you notice strange cracks along the columns between your garage doors? They may have been horizontal or vertical, wide or narrow, but no matter what they looked like, garage column cracks can mean you have a problem with your foundation. Because garage columns are often made of brick or concrete, when the foundation beneath them shifts, they are the first thing to crack or lean. This can be extremely hazardous because most garage columns serve as supports for the entire structure. Ignoring these problems won’t make them go away, which is why you should give Rapid Foundation Repair a call. 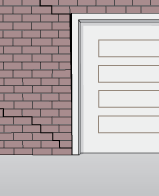 Garage column cracks are often caused by a sinking garage foundation. Poor soil compaction or excess moisture can make your foundation shift and crack, causing whatever is above it to shift and crack as well. This means big problems for your garage columns. If you have garage column cracks, you may also be noticed cracked floors, leaning walls, or possibly sticking doors or windows. All of these signs point to foundation failure beneath your garage and should be taken care of quickly. Garage column cracks must be fixed in two ways: the garage column itself and the foundation beneath it. The garage column, if leaning, must be supported and straightened, and the cracks must be filled. This prevents them from getting any bigger. Most importantly, the foundation must be corrected. If it is sinking deeper into the soil, it will continue sinking until it is supported. 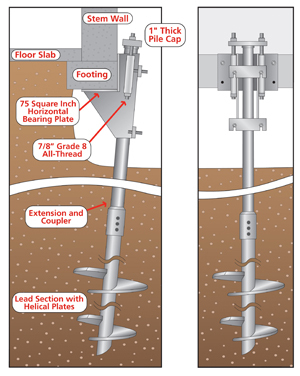 Rapid Foundation Repair offers multiple options for supporting your garage’s foundation such as steel push piers and helical piers. These piers will stabilize your foundation, raise it to its original position, and prevent future cracking. All piers used by Rapid are quality Earth Contact Products (ECP) steel piers that are meant to last. These are all benefits that come from choosing ECP steel pier or helical pier installation from Rapid Foundation Repair for your garage foundation repair needs. Once the cracks have been closed by supporting the column, cracks can be filled to prevent water entry. This repair will leave your garage column crack safe and secure for years to come. Don’t let foundation failure ruin your home and garage. 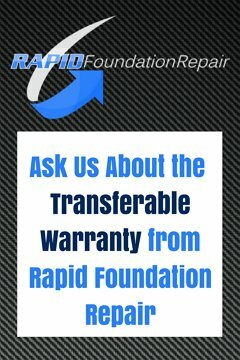 Let Rapid Foundation Repair solve the problem and keep your home safe. Contact us for more information on garage foundation repair options for your garage column crack.